Elite and novice netballers have all experienced an ankle injury at some time or another, the most common being the ankle inversion injury, or “rolled ankle”. 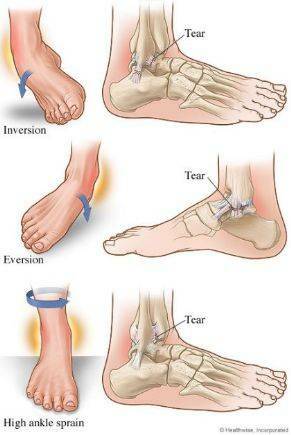 This type of ankle injury can be debilitating if not correctly treated from day one. This type of injury affects the ligaments on the outer aspect of the ankle, those that normally stabilise the ankle during dynamic movements. It can occasionally cause muscle tears of the Fibulari muscle group, and sometimes fractures of the bony attachment where some ligaments anchor (an avulsion fracture). An avulsion fracture may be suspected whenever severe pain is experienced with an inability to put weight through the ankle over three steps, marked tenderness just above the “bony point” of the ankle as well as considerable swelling. The ankle inversion injury is the most common lower-limb injury for an athlete to experience and is responsible for a large amount of time spent off the court. It is integral that this type of injury is properly rehabilitated from day one as chronic pain, ankle instability and tendinitis can all result from poor rehabilitation. If you have suffered from a past ankle injury or have recently experienced a rolled ankle, come in to Back To Health Physiotherapy and the expert team of Physio’s will be sure to help you speed up your return to the court.